There is much debate as to who, exactly, invented the original opera cake recipe and where. Some culinary historians have set it as far back as the 1890s, while others put its creation at a Paris shop in the mid-twentieth century. Most opera cake enthusiasts agree that the best - to some, the only - place to buy opera cake is at Dalloyau. 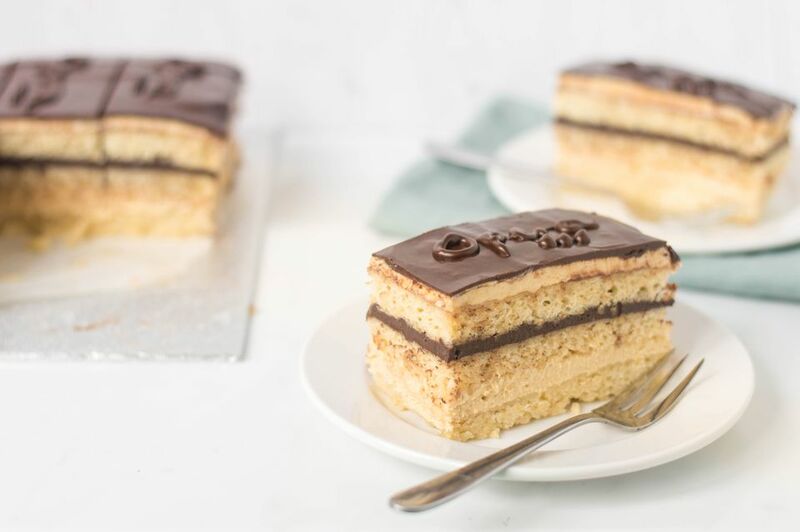 Whichever camp you fall into, we think you'll agree that this opera cake recipe is well worth the time investment. Layers of light almond sponge cake, coffee buttercream, and dark chocolate ganache make it the showstopping dessert. Do not be put off by the number of ingredients, it may be daunting but they effort is so worth the result. Note: while there are multiple steps to this recipe, this dessert is broken down into workable categories to help you better plan for baking. Preheat the oven to 425 F. Line two 15-inch by 12-inch pans with parchment paper and brush the surface of the paper with butter. Set them aside for a moment. Using an electric beater, beat the egg whites on high until they become foamy and start to expand. Sprinkle in the sugar, one teaspoon at a time, until all of it is incorporated into the egg whites. Continue beating the meringue until it is glossy and holds stiff peaks. In a separate bowl, beat the ground almonds, confectioners' sugar, and whole eggs on medium just until the mixture becomes light and foamy. Gently stir the all-purpose flour into the almond batter. Then, gently stir 1/4 of the almond batter into the whipped egg whites. Fold the remainder of the almond batter and the melted, cooled butter into the egg whites. Divide the sponge cake batter between the two prepared pans and bake the cakes for 5 minutes, until the surfaces spring back from a light touch. Cover the top surface of each cake with a fresh piece of parchment and carefully invert them onto a clean surface. Slowly peel back the old parchment from the cakes and allow them to rest loosely over the cakes to prevent them from drying out. Stir together the espresso powder and boiling water and set the mixture aside for a moment. In a medium saucepan, set over medium heat, bring 1 cup sugar, 3 tablespoons water, and 1 teaspoon vanilla extract to a boil. Continue cooking it until it reaches 255 F on a candy thermometer. Remove the sugar syrup from the heat and allow it to cool slightly. In a separate bowl, beat the egg and egg yolk until they begin to get fluffy. Continue to beat the mixture and add the hot sugar syrup to the bowl in a smooth, steady, slow stream. Once the syrup is incorporated, mix in the reserved coffee mixture. Continuing to beat on medium-high and add the butter, one tablespoon at a time, until it is fully incorporated into the buttercream. The coffee buttercream is complete once it turns thick and fluffy. In a medium saucepan, set over medium heat, bring the milk and cream to a boil. Remove the pan from the heat and stir in the chocolate. Continue stirring the chocolate for 2 minutes, to ensure a completely smooth texture. Line a large baking sheet with parchment paper. Cut one 10-inch by 10-inch square out of each layer of cake and place it on the baking sheet. Carefully spread 3/4 of the coffee buttercream over the surface of one cake. Lay on another layer of cake. Spread the ganache over another cake in a smooth layer. Place the last layer of cake over the ganache, and then spread it with a thin layer of the coffee buttercream. Melt the chocolate in a double boiler and stir in the clarified butter until the glaze is smooth; pour the chocolate glaze over the cake. Allow it to set in the refrigerator, then cut off the edges before serving. Since this recipe has many steps, make sure that you read through the recipe fully at least twice so that you have a good understanding of the ingredients and processes that you'll need to use. And just take your time.